Home / Archive / Opportunies for Freeview channel operators as shopping channels cease? Opportunies for Freeview channel operators as shopping channels cease? The closure of Bid and Price Drop TV now that owner sit-up Ltd has gone into administration looks set to offer new possibilities for capacity constrained Freeview service. No channel changes are expected immediately, as the cessation of broadcasts comes just ahead of Easter. And Freeview channel number rules do allow channels to stop broadcasting and keep their channel numbers for a limited period of time under certain circumstances, in the event that the administrators KPMG think they can revive the shopping channels in some form or other. In the interim, forthcoming local TV services in Scotland and Wales, such as STV Glasgow - launching in June - could benefit by being promoted from channel 26 to Bid's channel 23, in line with current policy promoting local TV channels up the Freeview channel list as "local public service broadcasters". A shrewd ITV would then be looking at bagging channel 26 for its new ITVBe channel coming to Freeview later in 2014. 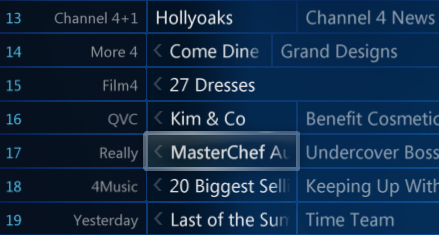 Under the rules governing Freeview channel numbers, because neighbouring channel 27 is occupied by itv2+1, it could promote its channels up the channel list by virtue of being "associated channels" to hold channel 26 until ITVBe launches; additionally it can reshuffle its channels among the channel numbers it holds once a year. Candidates for channel 37 include Quest or ITV - moving another associated channel (e.g. The Store or itv4+1) up the list. Other public service broadcasters including Channel 4 and 5 may want to use the chance to promote Channel 5+1 or Film4+1 up the list. ; then if it remains vacated. And so on for up to five positions above and below the vacated LCN; and then if it remains vacated. (iii) Finally, to any new associated channel launching on the platform. Any channel provider offered a vacated LCN will have two weeks in which to consider the offer and respond in writing to Digital UK; beyond which time Digital UK may offer the LCN to another channel provider. If no public service channel or associated channel takes the vacated LCN under the process described in paragraphs 8.2 then it will remain vacant until such time as a new public service channel or associated channel launches on the DTT platform or Digital UK undertakes a shuffle-up procedure or Digital UK for any other reason deems it reasonable to use the LCN. Channels already on the platform may not request vacant LCNs from Digital UK; Digital UK will always offer vacant LCNs to channels as described above. A channel provider may elect not to move a channel into a vacated LCN offered to it in accordance with this section of the Policy. .... If large gaps or large numbers of gaps open up between LCNs within a genre Digital UK may undertake a shuffle-up procedure under this paragraph of the Policy to close some or all of the vacant LCNs within that genre. DTT – Digital Terrestrial Television: the platform that the Freeview service is based on. LCN – Logical Channel Number: the channel number you select to watch a channel on Freeview. Whatever happens, the channel numbers look set to become available at a time when Digital UK is close to announcing a reshuffle of Freeview channel numbers in the news and children's genres because the "general entertainment" section is near full capacity following the allocation of channel 66 to CBS Reality and the currently unknown broadcaster that appears to have secured channel 65. What could happen to the bandwidth used by bid and price drop? Unlike cable and satellite services, there are considerable restraints to how many channels can be broadcast through a regular TV aerial. This has led to Freeview or "digital terrestrial television" carriage costs being considerably higher than for other platforms. During a period of high demand and limited supply of Freeview slots in 2004 and 2005, prices exceed £10 million for a slot. This has deterred some channels from launching on Freeview. New encoders, changes in broadcast parameters around the time of digital switchover and a reduction in resolution means broadcasts need to rent a much smaller proportion of bandwidth to broadcast on Freeview. This coupled with less demand has reduced prices. Bid TV's slot is on the Arqiva-owned "COM5" multiplex, which is also the home of Sky News, Pick and Challenge among other channels. The slot is available from 08:00 to 00:00 every day, with capacity used for other services during the night, but the multiplex could be reconfigured to allow changes in the available times - indeed there has been some bandwidth on the multiplex that has been kept "empty" for some time, and speculation that a slot for a fourteenth channel could be created. It could allow, for instance, a channel such as Travel Channel, to boost its hours if it so wished. COM5 has in the past year been twice the home of additional BBC Red Button coverage during first Wimbledon 2013 and then the Winter Olympics in Sochi. With the addition of "Quest+1", it was looking possible that there would be no surplus capacity to offer such an additional service on Freeview during the forthcoming summer of sport if the BBC and Arqiva so wished (and if Ofcom approved of BBC use of commercial TV capacity). Price Drop TV's slot is on the Arqiva-owned "COM7" multiplex, which is configured to be receivable on Freeview HD / DVB-T2 compatible devices only, and has limited UK coverage. The lack of availability on standard definition Freeview devices and reduced coverage might deter a larger broadcaster from taking up the slot, but would allow a niche channel or a channel wishing to test Freeview carriage to try out distribution on Freeview. COM7 already has a standard definition channel in the form of Al Jazeera Arabic on channel 84. But this channel could move elsewhere - even to COM5 - to allow the multiplex to resume its original purpose of providing more HD channels on Freeview. Technically five HD channels could broadcast at any one time on COM7. Currently only four HD channels broadcast at any one time on the multiplex. One of them is Community HD, which is upscaled HD only. It will be interesting to see how it all pans out, but it could be a valuable opportunity for a channel wanting to gain Freeview carriage.